BO085. 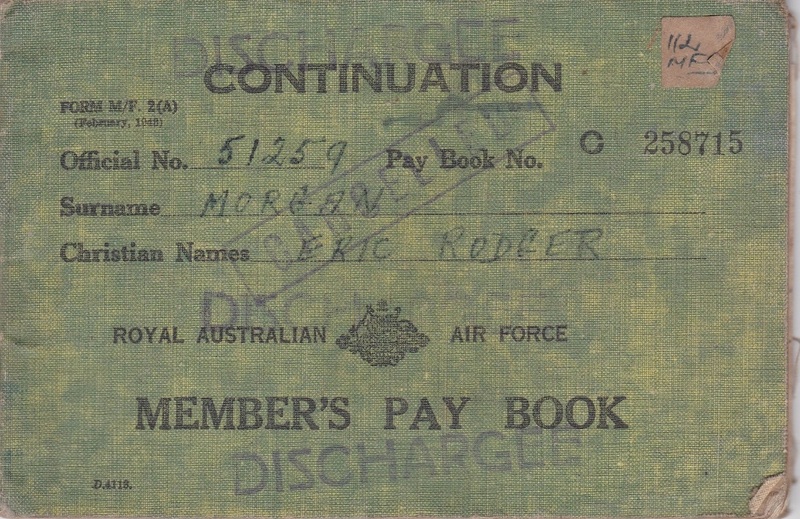 A mid green pay book named to 51259 Eric Roger Morgan who was born on 7 May 1909, enlisted at Melbourne on 26 Feb 1942 and discharged as a Flight Lieutenant on 9 Oct 1945 from Headquarters Northern Command. BO090. 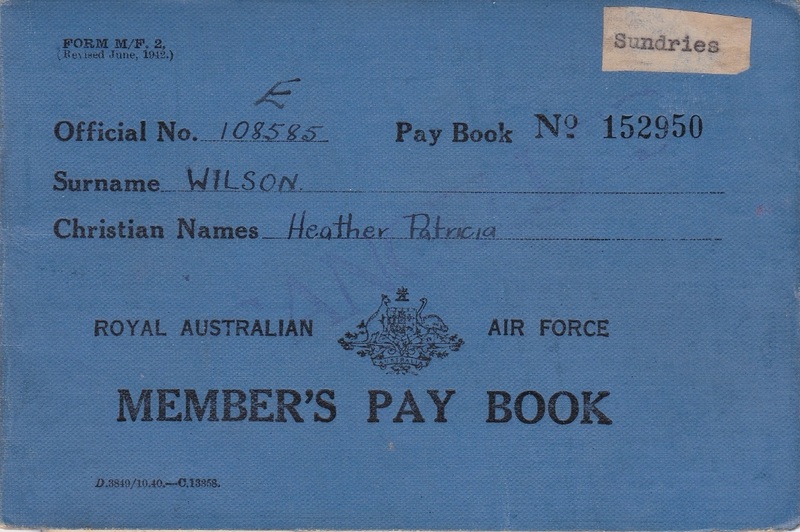 A mid blue pay book named to WAAAF 108585 Heather Patricia Wilson who was born on 24 Nov 1921, enlisted at Sydney on 28 Jan 1943 and discharged as a Corporal on 3 Dec 1945 from Headquarters Eastern Area. BO105. 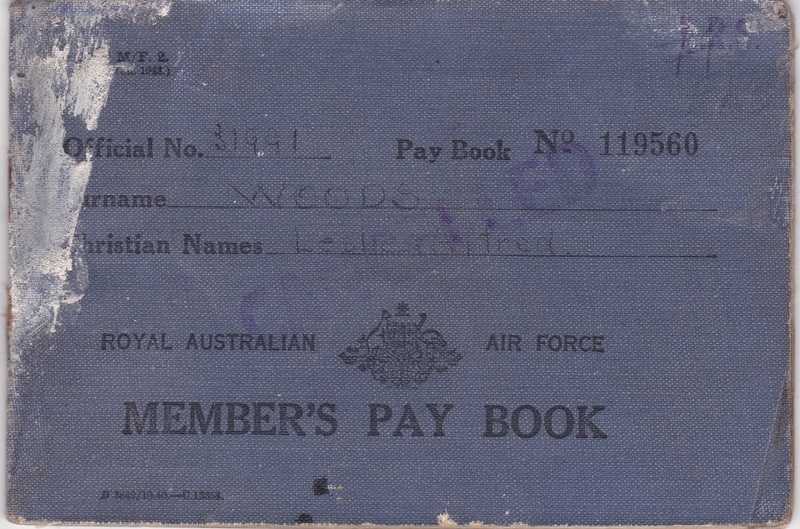 One blue pay book named to 31991 Leslie Alfred Woods who was born on 30 Jun 1920, enlisted at Hobart on 27 Jun 1942 and discharged as a Leading Aircraftsman on 25 Mar 1946 from Care and Maintenance Unit Tocumwal. 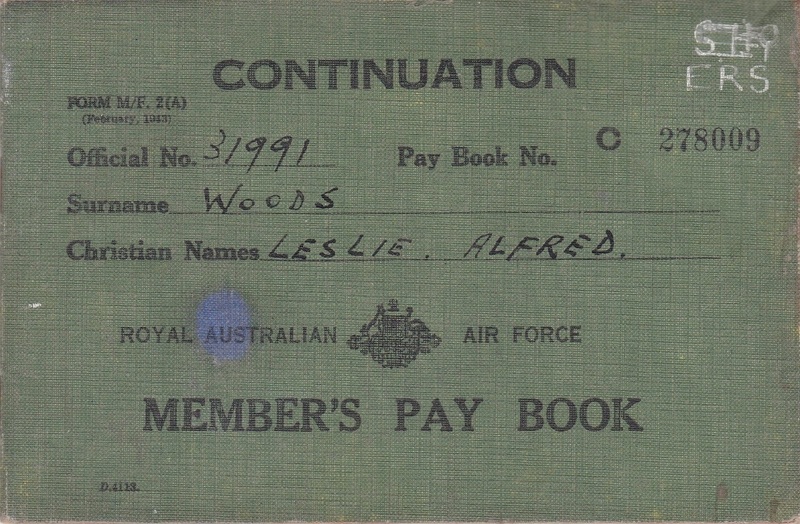 BO105a. . One green pay book named to 31991 Leslie Alfred Woods who was born on 30 Jun 1920, enlisted at Hobart on 27 Jun 1942 and discharged as a Leading Aircraftsman on 25 Mar 1946 from Care and Maintenance Unit Tocumwal. BO106. 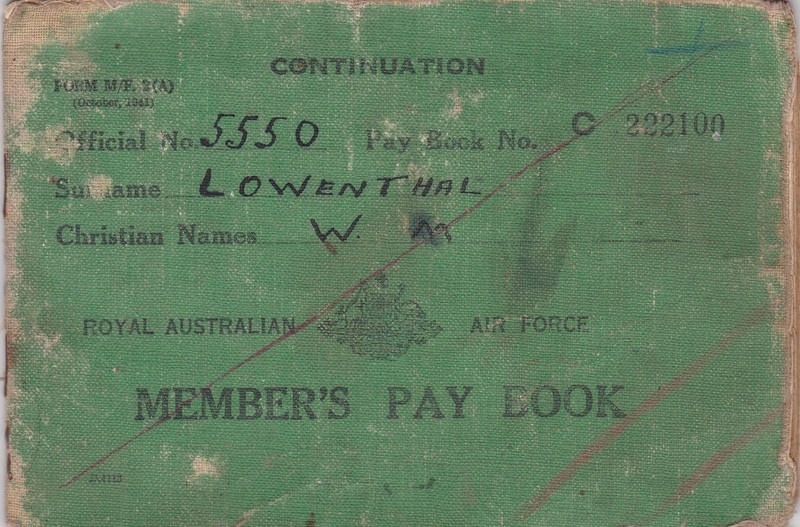 A mid green pay book named to 5550 William Marcus Lowenthal who was born on 23 Sep 1909, enlisted at Laverton on 18 Dec 1939 and discharged as a Flying Officer on 12 Apr 1946 from 24 Air Stores Park. BO106a. 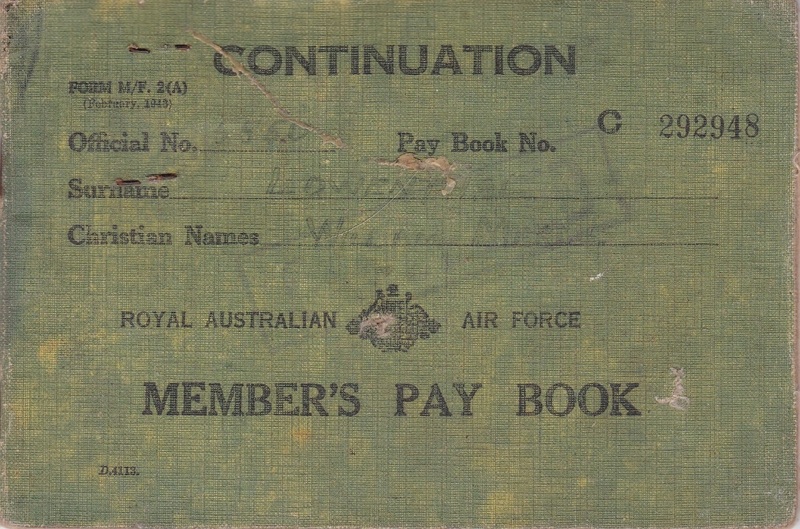 A light green pay book named to 5550 William Marcus Lowenthal who was born on 23 Sep 1909, enlisted at Laverton on 18 Dec 1939 and discharged as a Flying Officer on 12 Apr 1946 from 24 Air Stores Park. BO106b. 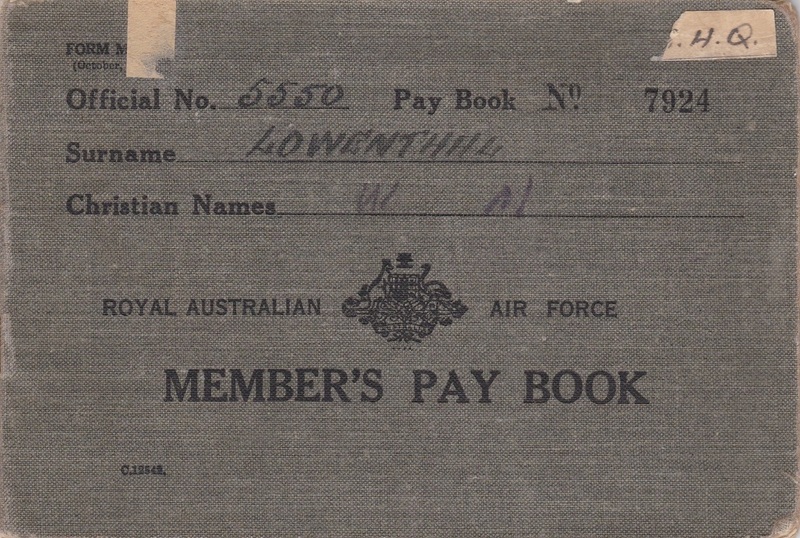 A khaki pay book named to 5550 William Marcus Lowenthal who was born on 23 Sep 1909, enlisted at Laverton on 18 Dec 1939 and discharged as a Flying Officer on 12 Apr 1946 from 24 Air Stores Park. BO107. 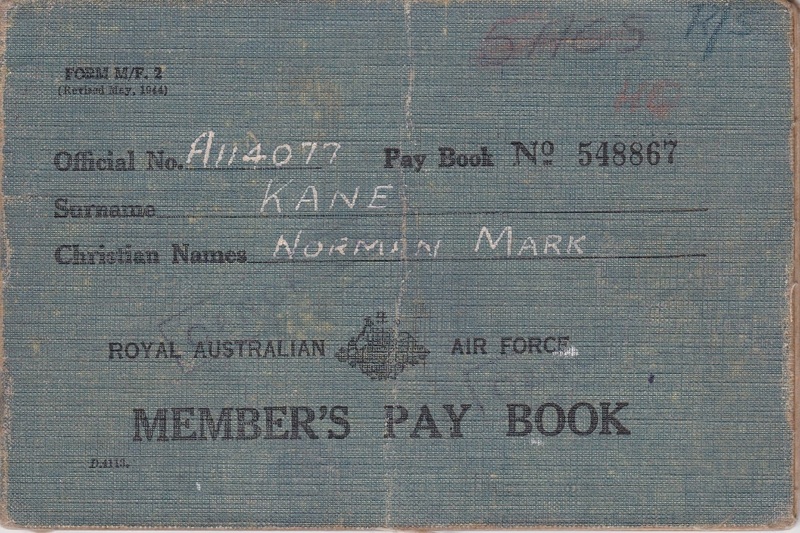 A blue/green pay book named to A114077 Norman Mark Kane who was born on 22 Feb 1933 and enlisted on 22 Jan 1953 as a Motor Transport Driver. BO108. 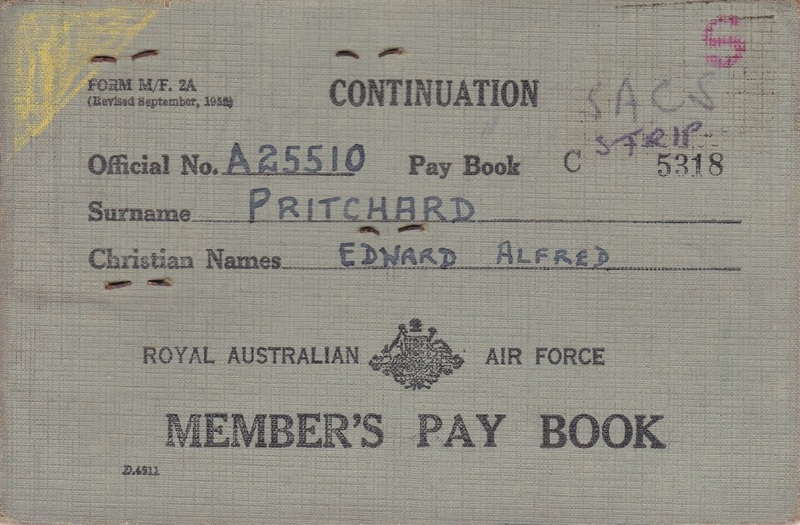 3 pay books named to A25510 Edward Alfred Pritchard who was born on 6 Dec 1928 and enlisted on 20 May 1952 as a General Hand. BO109. 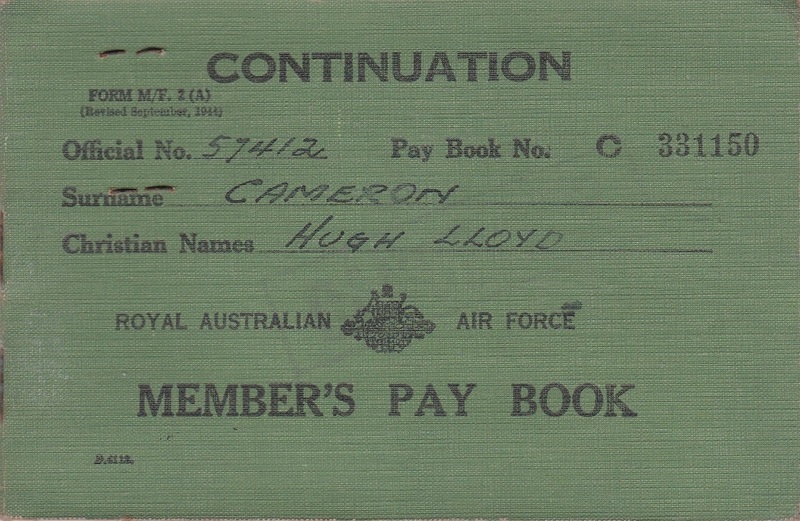 A mid green pay book named to 57412 Hugh Lloyd Cameron who was born on 19 Dec 1906, enlisted at Melbourne on 9 Jun 1942 and discharged as a Corporal on 29 Mar 1946 from AFHQ (Records). BO110. 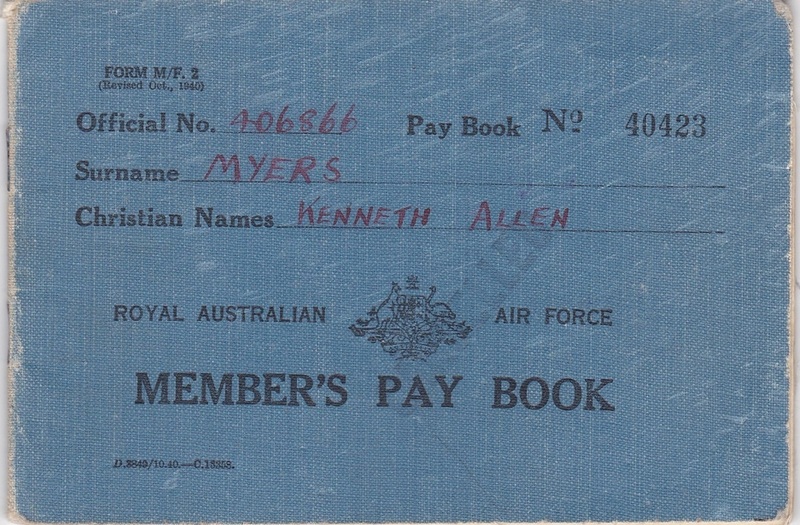 A mid blue pay book named to 406866 Kenneth Allen Myers who was born on 8 Jan 1918, enlisted at Perth on 28 Apr 1941 and discharged as a Flight Lieutenant on 28 Feb 1946 from 36 Squadron. BO111. 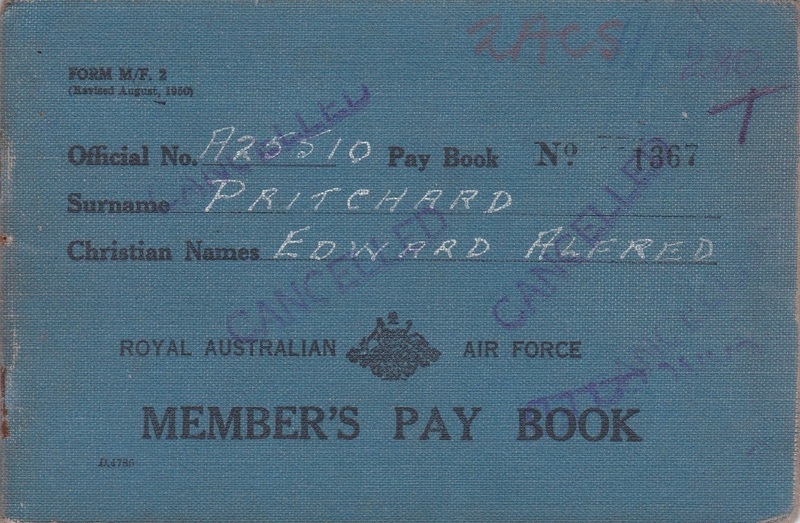 A dark blue pay book named to 251628 Arthur Lawrence Hall who was born on 5 Mar 1909, enlisted on 12 Aug 1940 at Ascot Vale and discharged as a Squadron Leader on 17 Oct 1945 from RAAF RAD 5. BO112. 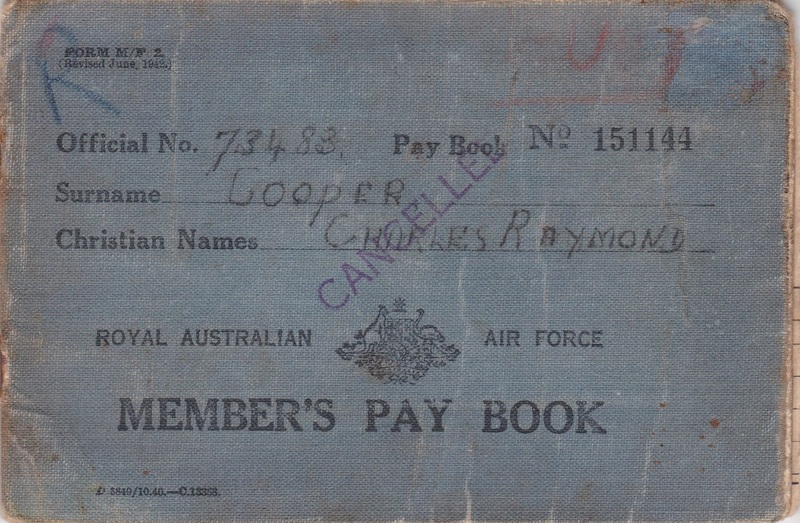 A mid blue pay book named to 73483 Charles Raymond Cooper who was born on 6 Oct 1924, enlisted at Sydney on 1 Dec 1942 and discharged as a Leading Aircraftsman on 30 May 1946 from 31 Squadron. BO118. 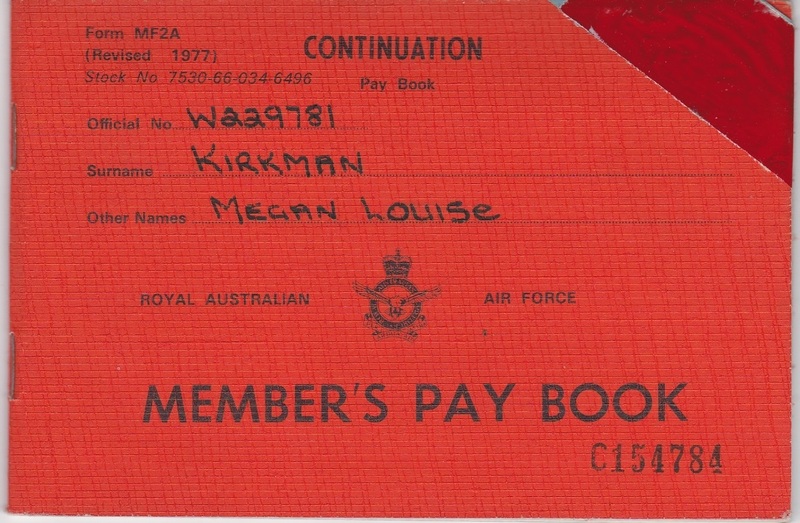 An orange pay book named to WRAAF Megan Louise Kirkman who enlisted on 27 Sep 1976 as a Supplier. BO132. 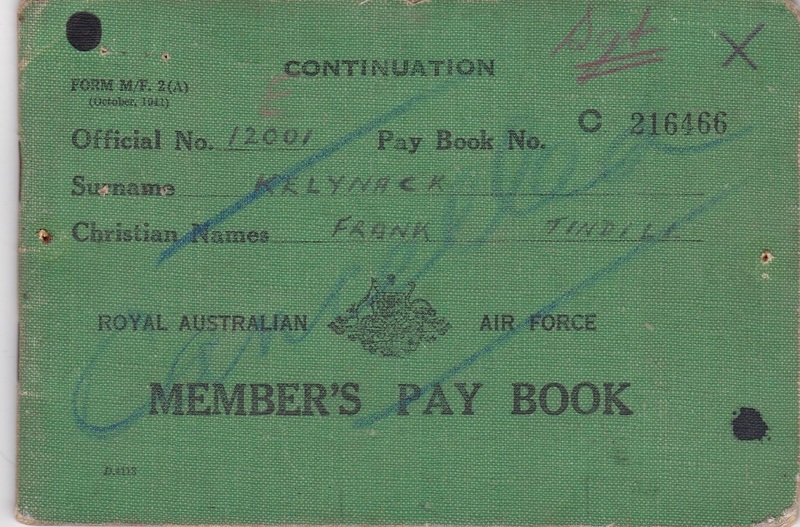 A mid green pay book named to 12001 Frank Tindill Kellynack who was born on 23 Dec 1904, enlisted at Richmond on 15 Jan 1940 and discharged as a Warrant Officer on 13 Jan 1949 from EAHQ TDRS. BO382. 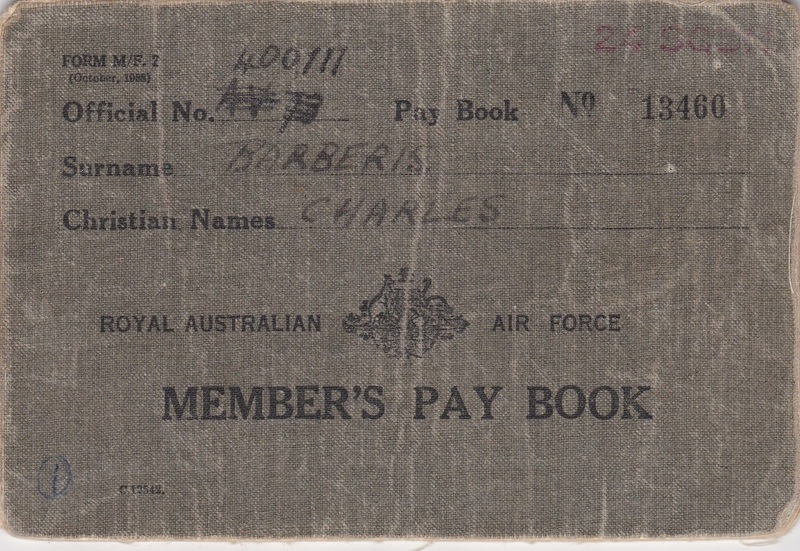 A khaki pay book named to 400111 Charles Barberis who was born on 1 Mar 1919, enlisted at Melbourne on 27 May 1940 and discharged as a Sergeant on 17 Jan 1946 from Radio DEV & INST Unit Melbourne. 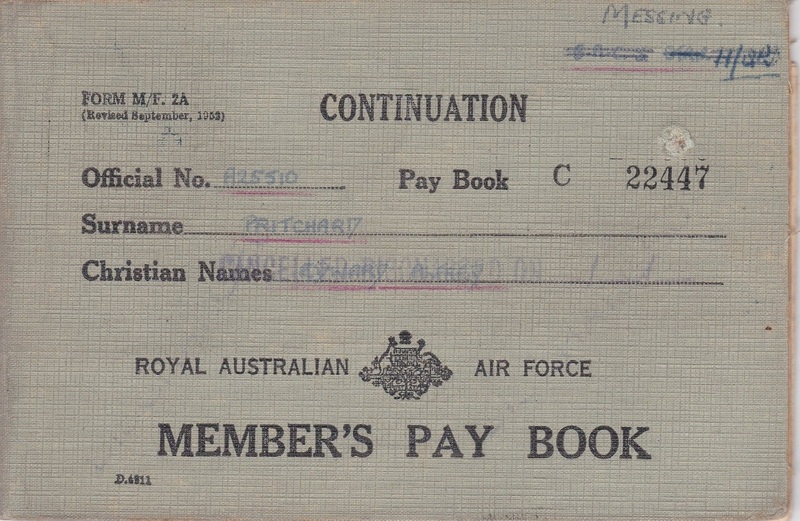 BO383. 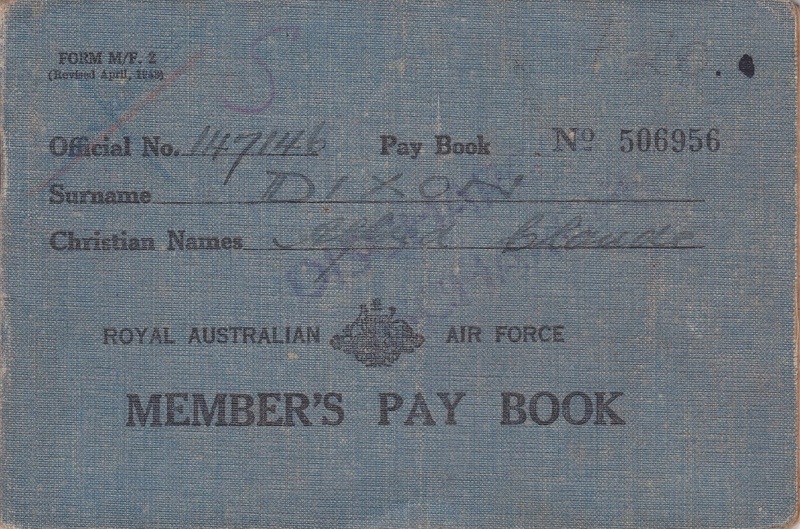 A mid blue pay book named to 147146 Alfred Claude Dixon who was born on 27 Mar 1909, enlisted at Melbourne on 16 Feb 1944 and discharged as a Leading Aircraftsman on 30 May 1946 from No 5 Radio Installation and Maintenance Unit. 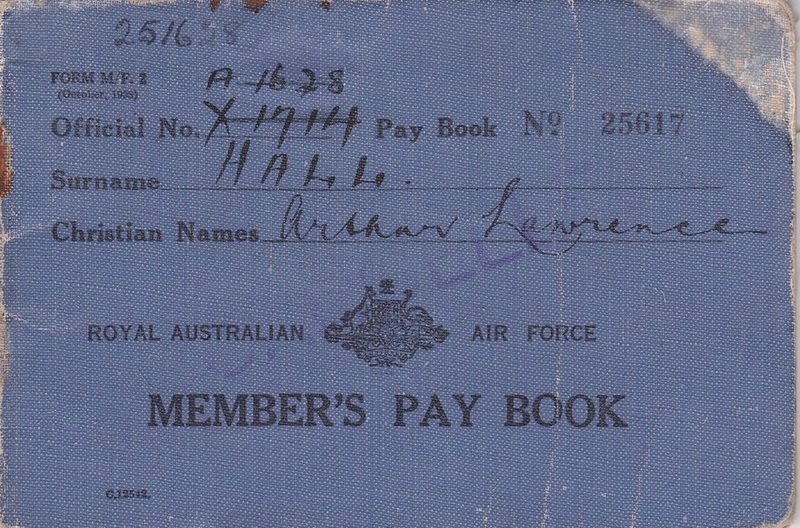 BO789. 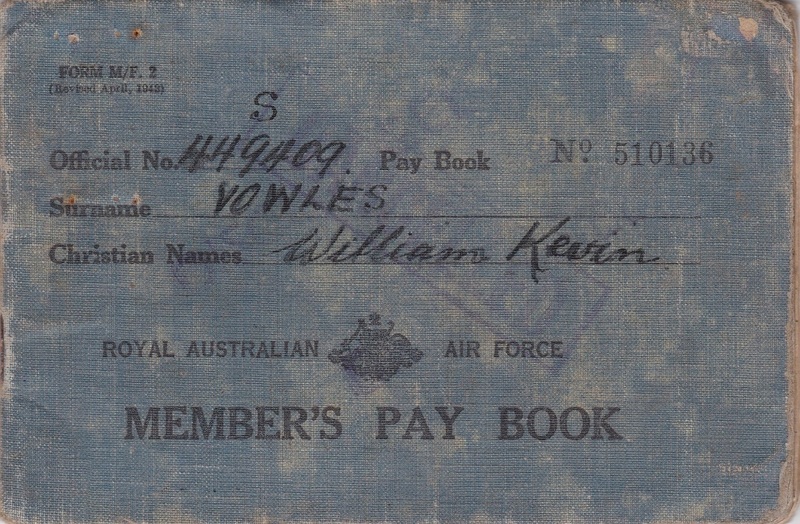 A grey pay book named to 449409 William King Vowles who was born on 20 Sep 1925, enlisted at Melbourne on 24 Mar 1944 and discharged as a Leading Aircraftsman on 28 Feb 1946 from 2 RAAF Hospital (STAFF). BO800. 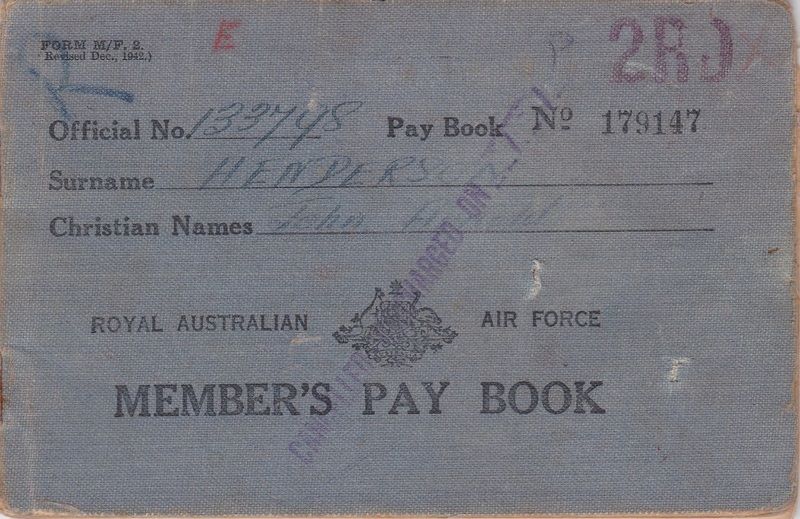 A grey pay book named to 133798 John Arnold Henderson who was born on 22 Feb 1917, enlisted at Sydney on 11 May 1943 and discharged as a Leading Aircraftsman on 10 Jan 1946 from NWA W/T.